Why C M Naim Missed The Famous Book of H.M. Sarwar Nizami? I have gone through American Professor C M Naim's Research (See here) on Naimatullah Shah Wali (R.A.) Predictions few weeks ago. I figured out his research is not up to the mark due to many factors. My last post was about his research. Now in this post, I am raising many questions but lets first discuss some parts of his research on which he agreed. 1. "The first recorded appearance was in 1850, after the “Jihad” movement of Syed Ahmad had failed in the north-west, followed by serial appearances after the debacle of 1857, the dissolution of the Ottoman Caliphate and the failure of the Khilafat and Hijrat movements in 1924, the Partition of the country and community in 1947, and the Indo-Pak war of 1971-72." So C M Naim accepted these predictions have recorded appearance. 2. "The opening verse of Q1 reads: qudrat-i-kirdigar mibinam// halat-i-rozgar mibinam (“I see the Creator’s powers; I see how Time fares”). The poem is now universally accepted as composed by a Sufi master who was born Syed Nuruddin but is known to posterity as Shah Ni’matullah Wali of Kirman (Iran)." So he is saying, "Mibinam" Radeef poem is Universally accepted. This is the most authentic and comprehensive book with a lot of explanations and spiritual knowledge. Why he deliberately hide/missed this most Important Book By H.M. Sarwar Nizami? Why he deliberately hide/missed the Book Shah Naimatullah Wali Paishangoiyan (1993) by Col. (Rtd) Matloob Hussain? H.M. Sarwar Nizami's Book is the most easily available book on Internet, Just go to Google and type Naimatullah Shah Wali, this book will be found on first page of Google.This is the only book with all three types of Poems mentioned by C M Naim himself but didn't include its reference. This is the only book whose English translation is also available since 2008. See Popular Posts of this blog. This book is on top since the start of this blog. Thousands of people already viewed this. But, I have a answer of this question, H.M. Sarwar Nizami was a student of Amanat Ali Shah Chisthi Nizami R.A. who was a Famous Wali Allah of 20th century. A glimpse of his knowledge can be seen in H.M. Sarwar Nizami's Book also. All the content other than predictions in H M. Nizami's Book is also very important and explains the knowledge of Aulia Allah (Friends of Allah) so C M Naim tried to hide this by not including this book's reference in his research as this book is very easily available and its predictions are mostly read in Pakistan. (All other references by C M Naim are not easy to search on Internet). All the knowledge of H.M. Sarwar Nizami has come from his mentor. 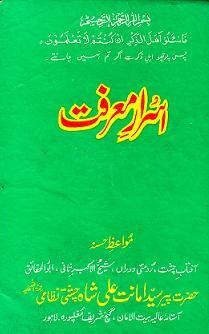 Book Asrar-e-Maarifat by his mentor opens the secrets of self. What is Ilm-e-Ghaib & Shahdah? What is Ilm-e-Ludni? What statuses a Man can achieve? How Aulia Allah foretell future through Kashf with the Will of Allah? and a lot of deep Knowledge about Tasawwuf & Maarifat. Allah had blessed him with the Ilm-e-Ludni (Divine mystical knowledge) and he was Sahib-e-Kashf himself. adj. worldly, pertaining to the material (as opposed to the spiritual or religious); nonreligious in nature; not belonging to a religious order. So word 'Secular' is directly opposite to word 'Spiritual'. How can a research by Secular person be impartial on a Spiritual Subject? 'Its title, “Ni’matullah Shah Wali”, clearly indicates Hamid’s source, for that arrangement of the name occurs only in the Anjuman’s booklet. All other books have: “Shah Ni’matullah Wali”. If he reads title page of H.M Nizami's Book, It is clearly written 'Hazrat Naimat Ullah Shah Wali R.A', so Shah comes after Naimat Ullah. Here are some more excerpts for C.M. Naim although he mentioned second one in his research. Shah Naimat's Predictions about Partition (1947) & Kashmir dispute have already proved. Below is a couplet referred by Haroon ur Rasheed and Prof. Ahmad Rafique Akhtar. If he thinks these predictions as Conspiracy Theories & Forgeries then 'Why couldn't he prove a single prediction wrong since their first recorded appearance in 1850 till now? In the end, I can point out many other flaws in his research because C M Naim manipulated the qaseedah and distorted certain established facts by saying these predictions Conspiracy Theories. I see his research as biased one and he showed just his point of view, hiding many other facts. I suggest Prof. C M Naeem to rewrite his research and consider above facts but first read some good book on spirituality written by a Saint, he can start by Asrar-e-Ma'arifat. This Naimat Ullah Shah Wali , is the person sunni or shia?. I heard he was shia and most of his predictions are based on shia beleifs. One poster advise other one on this site to go to any SHia book store and ask about this qaseeda. All shia book stores have this. I mean, predictions can be done by even non-muslims but we should not believe on them, Every thing would happened only by the will of Allah. I believe all this prediction business is just a drama to draw people's attention. If you don't believe in the predictions what difference does it make whether Naimat ullah Shah Wali was Sunni or Shia???? The Wali only foretell what Allah (SWT) want him to reveal. Since Aulia Karam are closer to Allah (SWT), so Allah (SWT) reveal his Will to them as much as Allah (SWT) wants. It is also known fact that these couplet dates back to almost 800 years and sofar proved accurate..
Jab Firon ko us kay Jadoo gar Musa (AS) kay baray may bata saktay hain jo kay Allah hi ko nahi mantay thay, to ik Musalman aur phir Allah (SWT) kay doston ka kya kehna! We evaluate every thing in the light of Quran and Sayings of Prophet Muhammad (SAW). If it fits the hints given in the hadih we accept it otherwise not and finally time actually testify its truthfulness or falsehood anyway! Whether u believe it or not you will find out soon enough. Thanks Brother Shams, Excellent Reply. After reading the research of C.M Naim, I found that his focus was not to research this topic but to target Zaid Hamid in particular where he tried to explain that Zaid Hamid are using these predictions to promote himself as "Lion of Ali(RA)" so clearly it seems to me that this research was ordered by some RAW-CIA backed elements in USA who want to counter the influence of Zaid Hamid and want to prove him worng especially after his stand against SAFMA. no doubt..this sacred azaan given by wali ullah nematullah shah wali in the honour of islam has been all over pakistan in electronic media by zaid hamid regarding ghuzwa e hind.and now this scripture has been circulating with vigorous interest on internet in iran and pakistan ..
i salute you the author of this blog 'faqr e ghyoor' who is doing a great sacred service with his research work..may allah continue blessing you with further spiritual knowledge..! @Anonymous - Naimat Ullah Shah Wali Was A Saint & Wali Of Allah Almighty. They Have The Knowledge Of Future Granted By Allah & That's Not A Drama. Allah Ka Banday Allah Kay Name Pay Bat Kar Day To Allah Us Bat Ko Taqdeer Bana Deta Hai. Get Out Of This Shia/Sunni Differences & Be A Muslim. Allah Hu Akbar ! Ya Rasool Allah ! Ya Ali ! http://naatbook.net The first ever islamic social network build just like facebook and twitter. Share it and join it..
Zaid Hamid are using these predictions to promote himself as "Lion of Ali(RA)" AS PER C.M Naim. But many are forgetting here that there are other lions of Ali. The AWAANS Awulad of Hazart Abbas. Who are more than 10 million in Pakistan 'The Awan Tribe is perhaps the most heavily recruited tribe for the Pakistan Army and who were also used by British army in second world war. Bravest of soldiers, toughest of cultivators and matchless as tent peggers. Allah is the best Judge. May Allah Unite us and save us from sectarian fighting.